Last night was our date night. 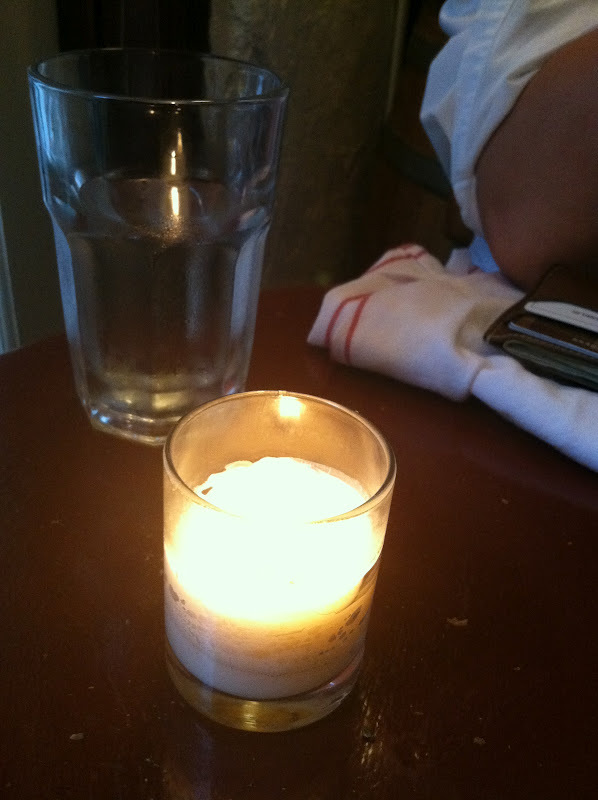 After a longish week for hubby, we finally had some time to relax. 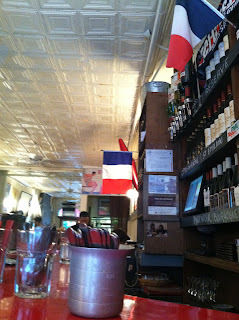 It's restaurant week throughout this and next week, and I wanted to go for some French food. 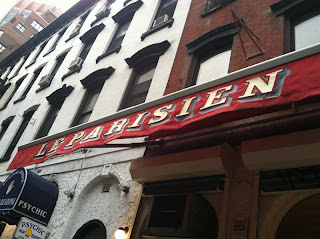 We settled for Le Parisien, a French bistro in Murray Hill. We walked over there from Grand Central to walk up our appetite. There were some pretty cute boutiques along the way. 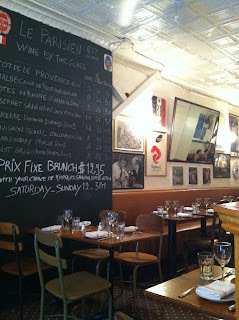 Murray Hill seems like a pretty nice/hip neighborhood, with 30 restaurants on each block. 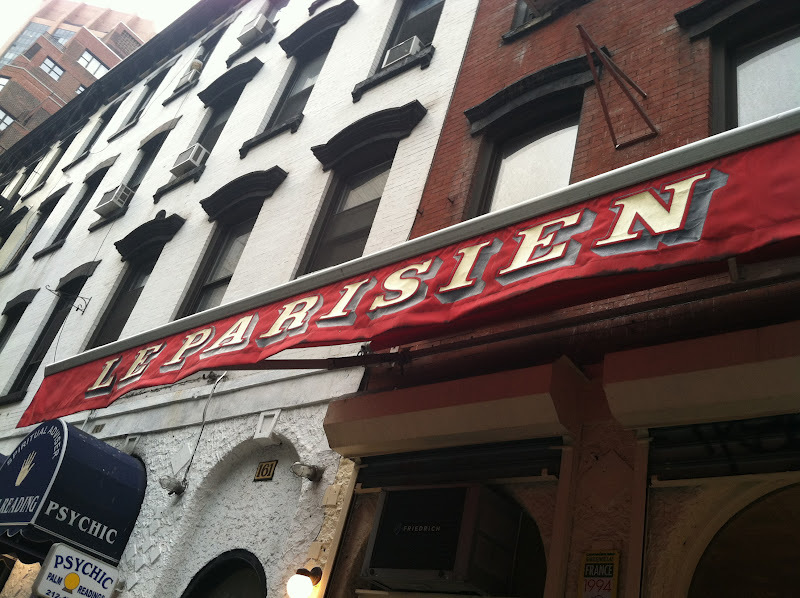 This French gem is located in the heart of a neighborhood. It got pretty good ratings on Yelp. We made reservations, but it didn't seem necessary when we went in around 7.30, because there was only us and another table with theatre-goers for a pre-theatre meal. 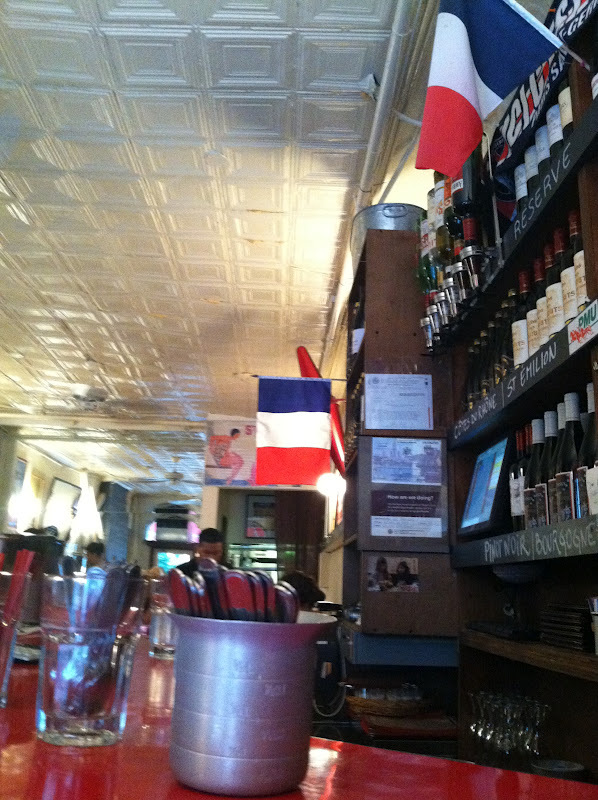 The decor is as French as could be, with pictures, souvenirs, posters from France, depicting the artistic culture of les francais. The waiter and waitress / bartenders were French, so I conversed with them a little bit (until they asked me if I've been to Bretagne, and I answered yes because I thought it was Britain!). Absolutely loved their bread in a simple tin basket. Tres simple, tres parisienne. 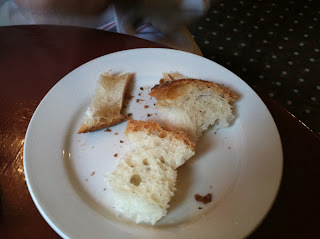 The bread was a light sourdough, with the softest bread I've ever tasted in the middle and a medium-hard crust to give it a bit of a crunch. The butter was very rich too, not just your average butter. 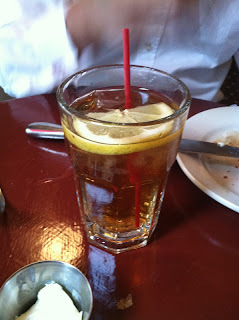 Hubby got an iced tea, which came with a floating lemon in it. We started with Le Parisien house salad with arugula, endives and grilled tomatoes. 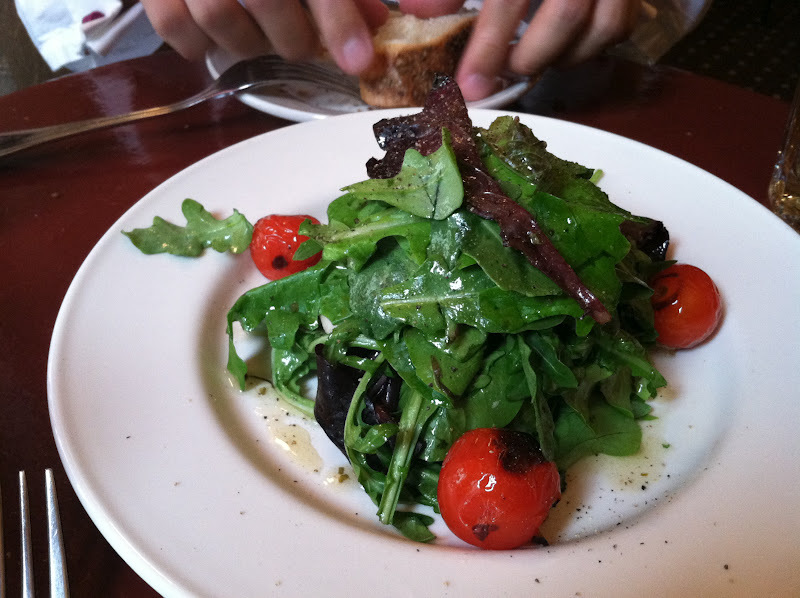 It was dressed with vinegraitte dressing and olive oil, which added a lot of flavor to the salad. I really liked the grilled tomatoes that added a twang of sweetness. 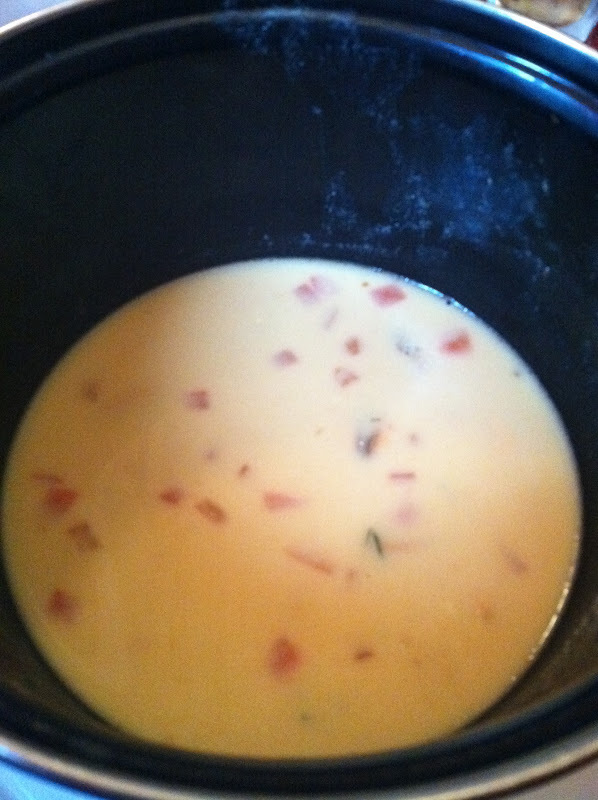 The greens were soft and soaked through with the dressing. I particularly liked the endives that added some crunchiness to it all. The waitress and waiter were both attentive, and came back with bread and drink refills every so often. This is really different from the islands where it's hard to flag down anyone. 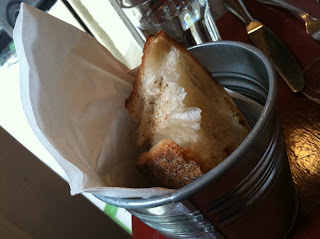 I had to stop myself from munching on the delish bread to save room for the mussels I ordered. Our food came 15 minutes after we ordered. My muscles came in a giant pot with the lid on, and a side of fries wrapped in a baking sheet. Hubby's dish was ginormous, with his steak frites cooked medium well and a large side of fries. 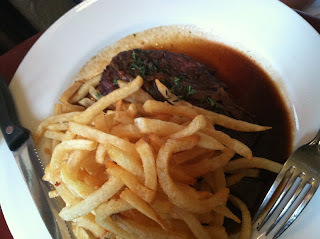 Hubby's bistro Steak Frites was cooked just like his wanted. 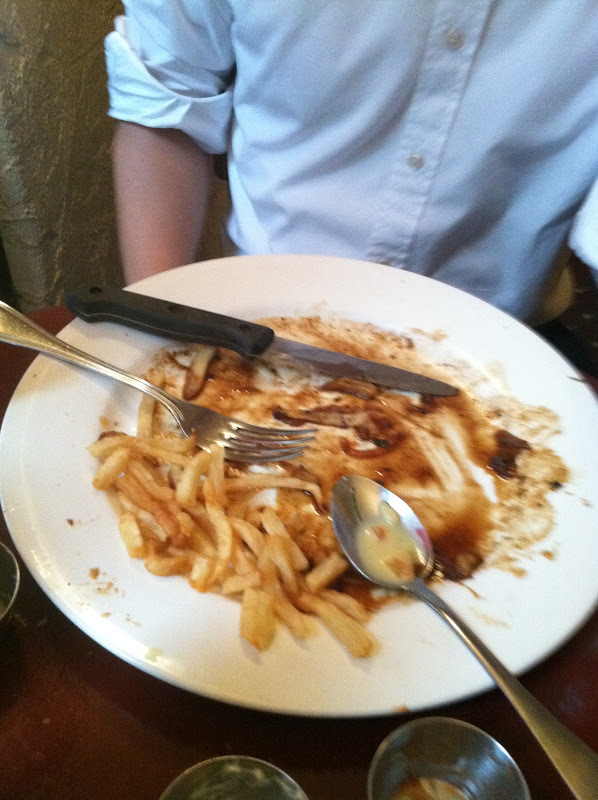 I tried a little of his meat with the red wine thyme sauce, which had a great salt-sugar balance. The wine added a twinge of sweetness and alcohol to the dish, which accented the steak's juiciness and freshness. I liked dipping my fries in it. Oh yes and a note on these curly fries - they were seasoned with garlic and fried to a crispy golden finish. They were so good to munch on, and because they were already seasoned, I didn't even need to use ketchup! (But I got some anyways because it's like a ritual. Their ketchup btw is like homemade or something because you can almost taste the tomatoes). 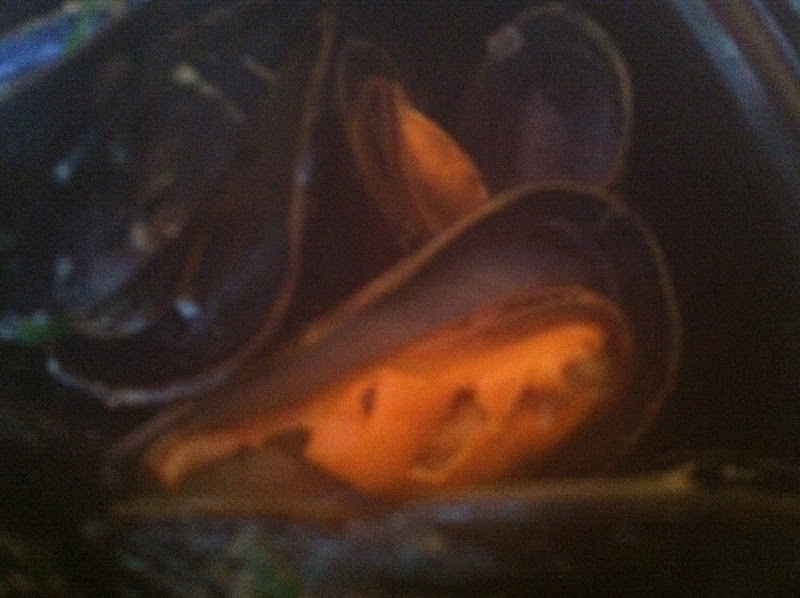 My mussels were juicy and fresh. So fresh that I tasted sand in one of them. 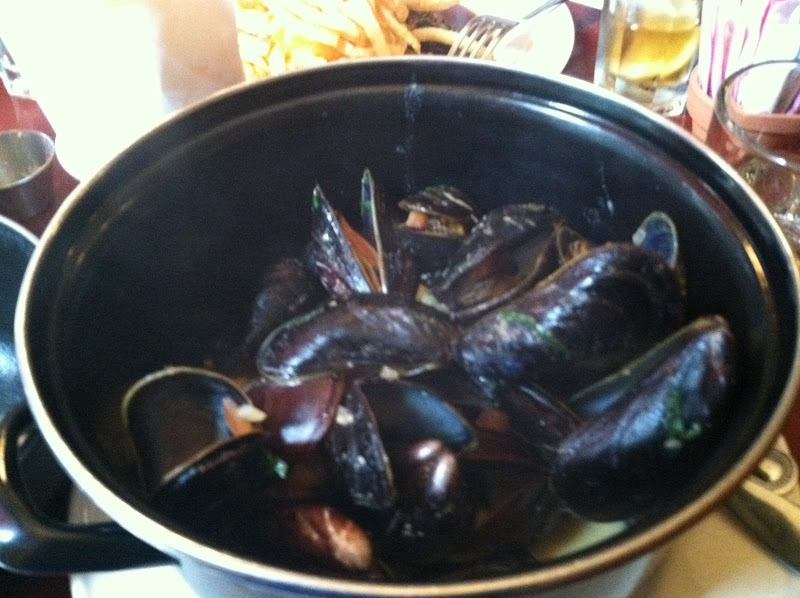 I was amazed by the sheer amount of mussels in the pot. 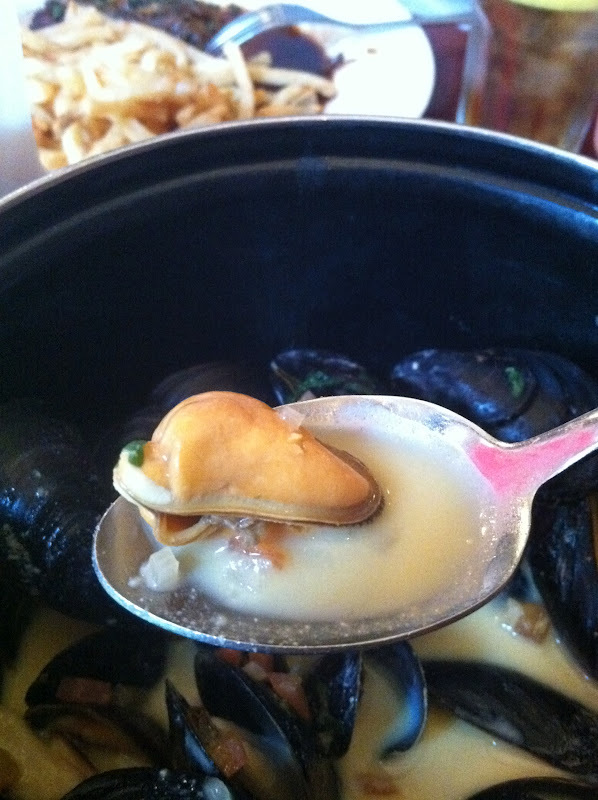 I used the little mussel fork to poke out the meat, and then hubby taught me to use the spoon and get some juice and drink it like a soup. The saffron and mustard cream was a bit sour to my liking, but it didn't effect my enjoyment of the mussels. Sip it like a gentle-woman! Towards the end, I just ended up getting out all the mussels into the soup because the shells were getting in the way. 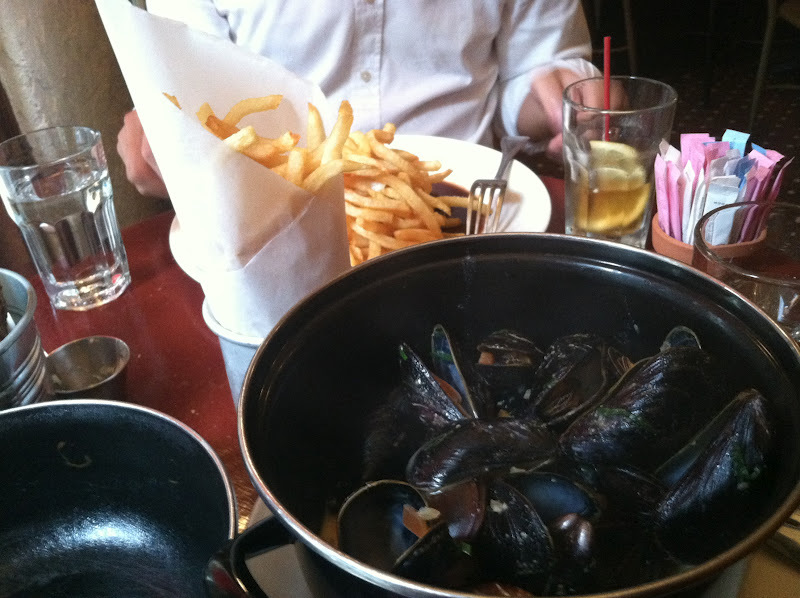 I was getting pretty full by now because of all the fries. The fries in the container looks deceptively small but they really pack em in. 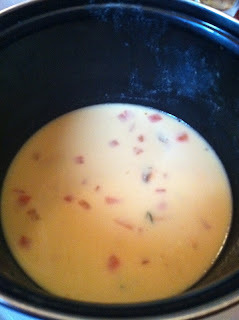 I had some soup left over, but the sauce was too sour for me to finish. 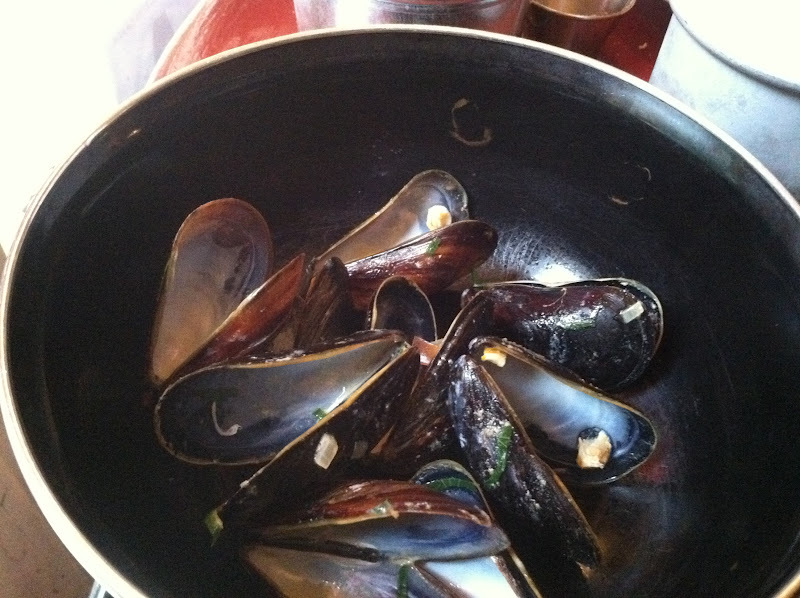 Hubby had to help me finish up some mussels, because it can get a little overwhelming with so many of them. 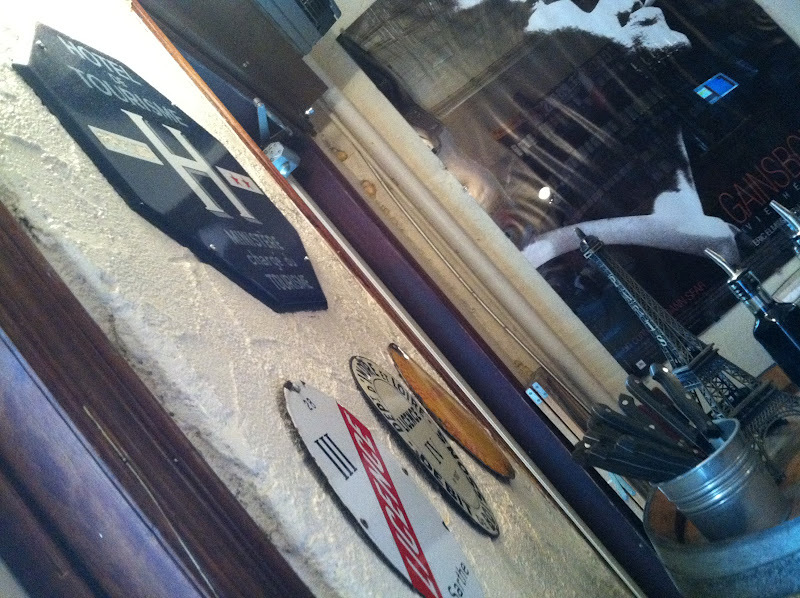 By now the restaurant was filling up pretty quickly. There were people of all shapes and sizes, mostly couples who were there for a pre-theatre dinner. The waitress kept on asking people coming in if they had reservations. A party of four Chinese kids wanted to get in, but they were told to wait outside because it was not their time yet (they made reservations at 8pm). 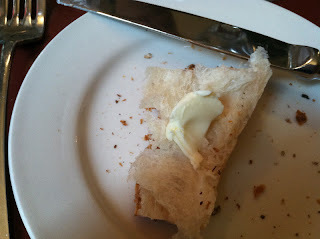 I guess that's why their bread is so fluffy soft in the middle - it's great to soak up the extra sauce! It must have taken abnormal strength to in finish up the fries, because they were clogging up my arteries towards the end. The oil was getting a little too much, and since they were curly, there was a lot of them towards the bottom that kept on getting stuck to each other. 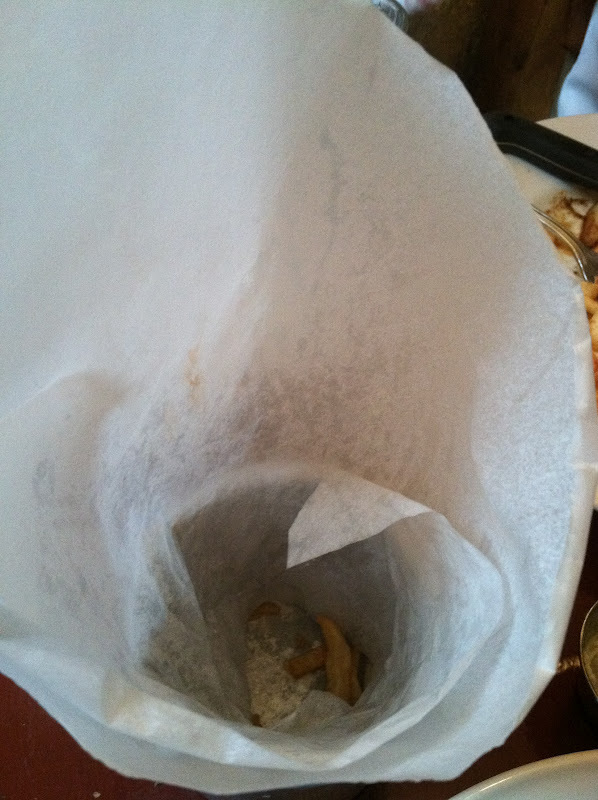 Yet somehow, I managed to finish all of my fries. 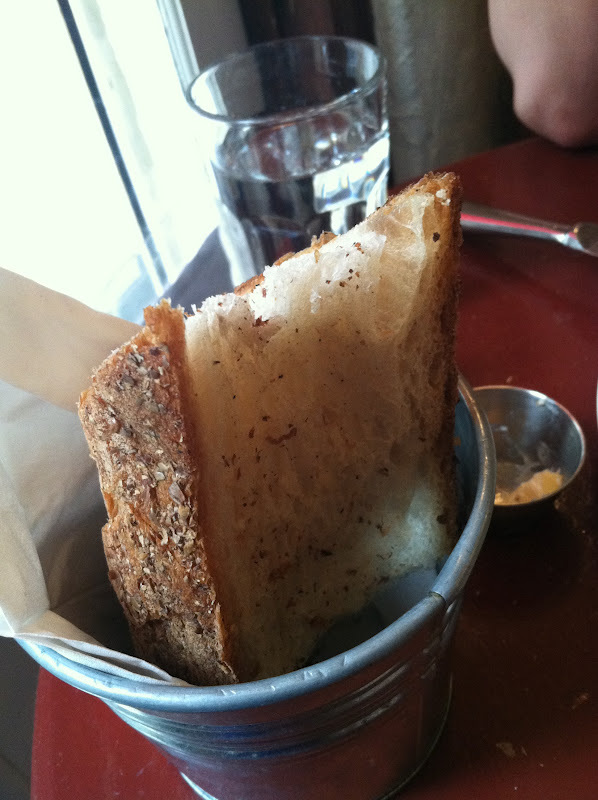 It got a little greasy towards the end, but I loved the fact that it was soft and starchy. Would have been nice to get more ketchup, but I ate it the French way like hubby suggested with the mayo, which I was pretty good too because the mayo was rich and just a tad sweet. It was a lovely meal, and I loved the service! 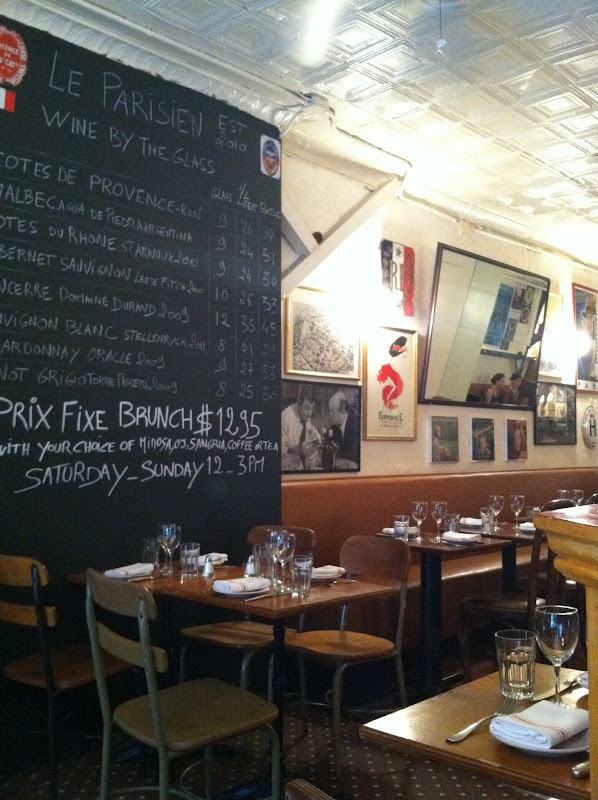 The place is really cozy and reminds you a lot of the artistic spirit and hospitality of the French, but without the busybody attitude of les Parisiens. (This place btw is run by people from Bretagne, a region northwest of France). Next time, I'd definitely love to try to the Panfried Skate or the mussels with Thai sauce. And maybe save some room for dessert, like their creme brûlée.